Update 07/19/16: Today, the team updated Inbox as a response to one of the most requested features. Now users don't have to choose between Done or Delete. Both options are now available on the menu bar, without requiring users to choose and access a menu to perform the other task. This enhancement will be available on both mobile and web. You will also notice the the option to choose what to do when finished with a message is gone from the settings page. I know this is something you all have been hoping for and am excited to bring you the news. Update 9/9/15: Empty Trash has now been added to iOs and should be available to everyone. 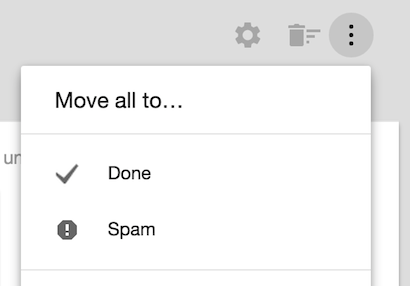 Update 8/3/15: Empty Trash has been added to the web version of Inbox by Gmail. Process is exactly the same as below for Android. Update 7/16/15: Well once again, google is proving they do listen to what users want. 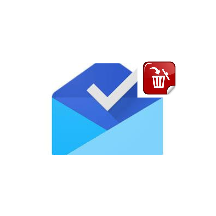 Today, it seems the Inbox team has started rolling out the ability to empty your trash from the Android App. This does not appear to have launched on the Web or iOs as of yet. Now when you go into your trash folder you are presented with a message notifying you that items in trash delete automatically after 30 days, but you also have an option to EMPTY TRASH NOW. So Deleters, rejoice - you got what you have all asked for. I am sure that Web and iOs will get this feature sometime in the future. 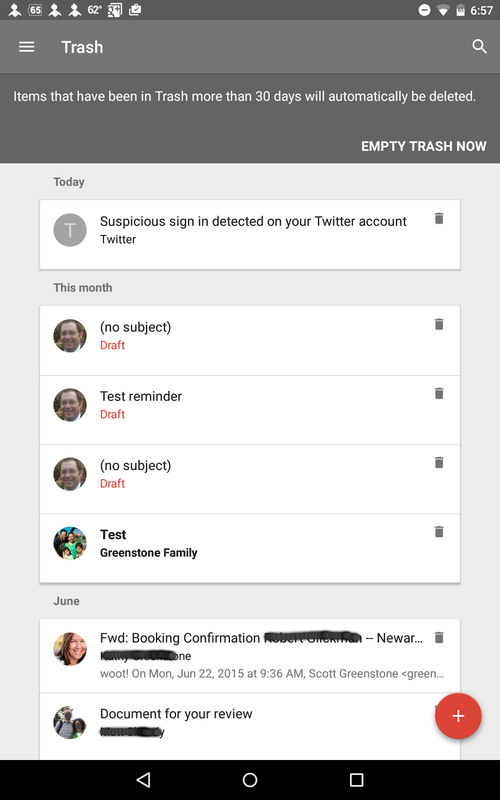 Update 5/28/15: Recently at Google I/O lots of new features in Inbox by Gmail were announced. 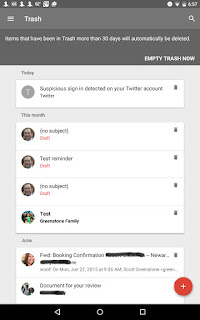 One of these features included simplification of the delete action. Now users will have the option to select an action when they are done with their messages. Found in Settings>Other users can select what happens when they mark a message as Done. They can opt to continue to keep these messages as Done in the Done bundle or they can have the messages moved to Trash upon marking as Done. It is extremely important to note that if the user opts to Move to Trash in this setting all icon instances of Done will be replaced with Move to Trash. In other words, when this setting is selecting for Move to Trash there will be a Trash Can icon instead of a Check Mark icon. In addition, Done will Replace Trash in the Move To menus. This is a very important thing to note, as after 30 days everything you mark as done (if you have this set to Move to Trash) will be removed from the Trash folder and will subsequently be unrecoverable. Users must be very careful when deciding to set this as Move to Trash. This feature will be an opt in feature, so when it rolls out, Mark as Done will be the default selection. 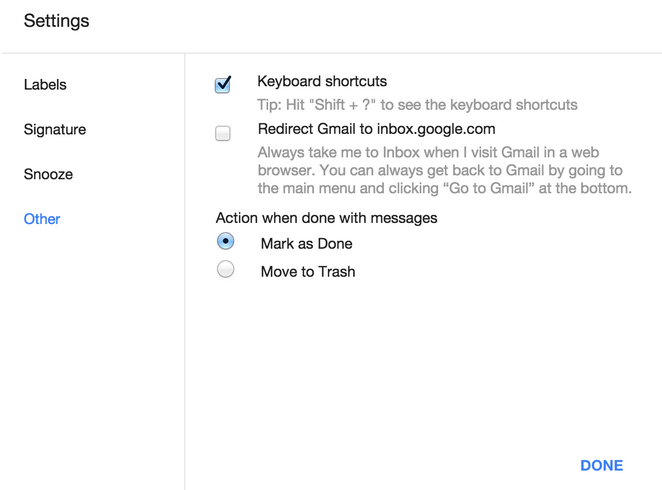 An additional feature introduced is the ability to Delete when multi-selecting emails. 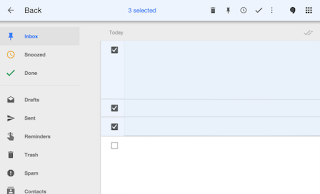 Now when you select more than one email, a fourth icon, a trash can, will appear at the top of the screen. This is to make it easier for users to delete multiple selections. As always, with any Google feature rollout, this will rollout over time, and not everyone will have these features on day one. 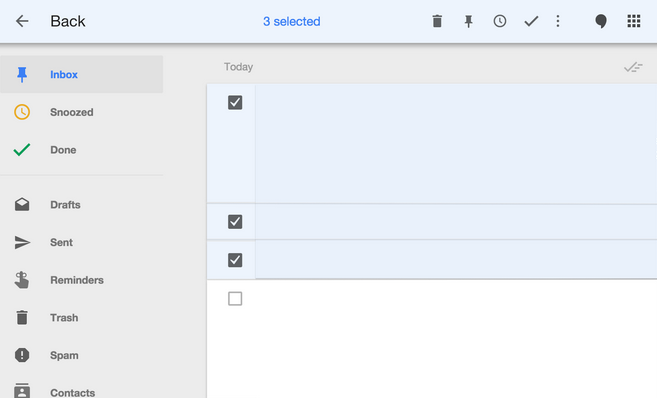 Lots and lots of questions, posts and concerns about deleting in the new Inbox by GMail. I have just discovered that it is possible to delete to all from your bundles in one click. One caveat, you can only do these with the emails that are currently bundled in the Inbox. If they have been marked done or snoozed, this procedure will not effect them. I know you are asking, come on already, how do we do this. It is simple. When you are in the Inbox, click on the bundle name. This will expand the bundle to show the emails that are currently in that bundle. Next click the three vertical dots to the right of the bundle name and you will see Move all to...Here you have multiple options: Trash, Spam, Remove from [Bundle Name]. Just select Trash and all your messages in that bundle will be sent to trash for permanent deletion in 30 days. Simple as that. 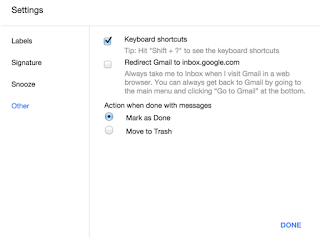 I personally have abandoned the deleting exercise since switching to Inbox, but I know many people are interested in this feature. Yes Done emails do use up space but each message is negligible in size. Thank you. How can I move all 'done' items to trash in one move? To continue, should I make 'move to trash' my default in settings to maximize available space? I just purchased a Mac, added the Inbox app, and it's taking up about 14GB of space, making my work just drag. Help!